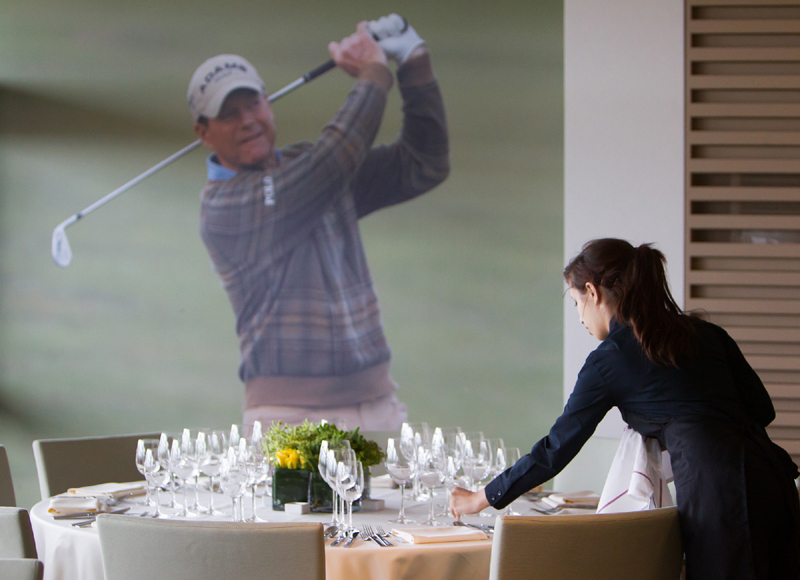 Businesses looking for an extraordinary meeting venue can for the first time book event and hospitality space on the final practice day for The Open Championship at Muirfield on Wednesday 17 July 2013. Standard business meetings and conferences look tame next to the opportunity to hold sales or motivational events during one of the world’s premier sporting events. The Open Championship returns to Muirfield on Scotland’s east coast from 17-21July 2013 and Sodexo Prestige, official hospitality provider to The Open Championship has developed the alternative package, which will allow delegates to power through a formal agenda – before soaking up The Open atmosphere and watching some of the world’s top golf stars in action. This alternative corporate hospitality package developed for the practice day on Wednesday 17 July offers a one-off opportunity and guarantees your meeting or conference, becomes one of the most talked about of the year. Brett Tonkyn, Director of Sales for The Open Hospitality said: “We are very excited to launch this unique meetings and conference package and can confidently say that nowhere else in Scotland will delegates be able to watch world class sporting action while conducting an AGM. “The Open Hospitality has a series of packages which offer the best in fine dining and hospitality and can be tailored to suit the individual needs of your event. “Beyond that is the chance to savour the drama of live sporting action, build relationships and enjoy award winning food and drink all at the same time. Located on Muirfield’s 9th Hole, The Open Hospitality offers the ultimate Championship experience, giving access to luxurious surroundings, fine food and unrivalled views of the course from where you can watch some of golf’s greats Rory McIlroy, Tiger Woods and Luke Donald compete. There are a number of private facilities available for companies, associations or groups looking to hold a meeting or conference. Depending on the format of your day, there are facilities to cater for numbers between 20 and 300 guests (subject to availability). Packages will be priced subject to your requirements, simply contact the hospitality team on 0844 371 0883 or email [email protected] for further details. A typical package could include VIP parking and entrance to the course, lunch and refreshments throughout the day, AV equipment and access to the high tech SKILL ZONE where guests can hone their golf skills. The Open Championship Official Hospitality Packages will be available throughout the championship which takes place between July the 17 and 21, for further information, please visit www.TheOpen.com/hospitality. Sodexo Prestige is the official caterer for The Open Championship – catering for approximately 6,000 hospitality guests; over 150,000 spectators; and providing up to 20,000 meals to the players and their families, caddies and the international media during the Championship. Public relations in Scotland for Sodexo Prestige is handled by the expert PR team at Holyrood PR, providing strategic communication advice and media relations.